Last year I used an 11-inch Apple MacBook Air as my mobile computer. I carried it from cafe to press event in a Tom Bihn Ristretto bag and I couldn't have been happier with my ultra lightweight and portable setup. Until, that is, my left hand started freaking out from some combination of the Air's ever so slightly shrunken keyboard/wrist rest area and my incredibly poor typing mechanics. Sometime around late Summer or early Fall of 2011 I gave up the ghost and switched back to my trusty old 13-inch MacBook Pro, which made my left hand happy but my right shoulder sad, as the weight of my work bag increased by at least 50%. Well, Happy New Year to me, I went and got myself a 13-inch Air! Now I've got the best of both worlds in a machine that's thinner, lighter, and faster than my old MB Pro. And Happy New Year to me, again! The folks at Tom Bihn saw fit to send me not one but two laptop bags to review by way of hauling my new machine from cafe to press event over the past month or so. In one corner is a slightly larger version of the Ristretto designed to accommodate my newer, slightly larger Air. And in the other corner, the all-new Cadet, a "minimalist briefcase" fitted with a protective sleeved designed specifically for said 13-inch MB Air (Cadet is available in sizes to fit iPad, 11/13″ Air, and 13/15″ MacBook Pro. And, as TB's website states, "While designed to fit Apples, there are many PC laptops that will fit too"). 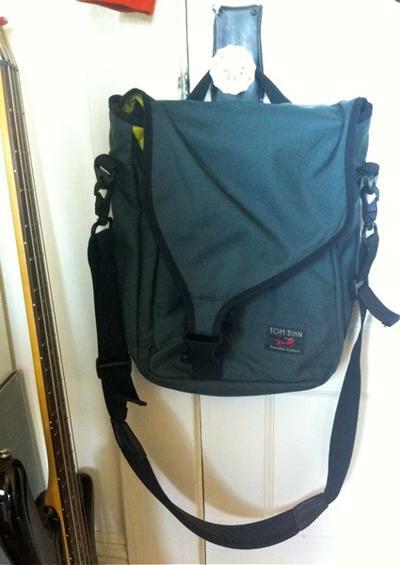 Tom Bihn makes nice stuff, though it don't come cheap. I've been using their bags for years now and tend to have my favorites as well as those I'm not so keen on. That distinction has always been based on style; I've never seen a Bihn bag that wasn't exceptionally well made, even if its look was too conservative for my tastes. From the toughness of their fabric to the solidity of their oversized metal snaphooks and D-rings, Bihn's goods have always impressed me out of the box and worn well during testing and travel. Such has been the case with the latest Cadet and Ristretto in question here. Both bags are solid and functional, well-designed and well-crafted, and carry price tags that bely their quality. And while I love the Ristretto for 13-inch MacBook Air ($135), I'm not nearly so fond of the 13/15 Cadet ($170). I actually used the Cadet with my MB Pro at CES this past January and it served me quite well. It's just that I don't much care for its style. But hey, beauty is in the eye of the beholder – and your eyes may well (be)hold Cadet in the highest esteem. That said, I'll get to that one later. For now, here's a little about my favorite of the pair, Ristretto. Ristretto is a 1 lb. 6 oz. 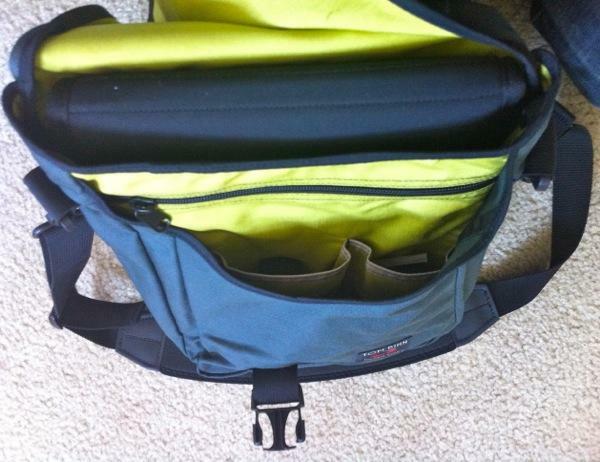 minimalist bag for minimalist computer users who want to carry minimal gear with them. Which is exactly why I like it. A buckle-secured exterior flap conceals an interior divided into three compartments, one of which is a computer slot with a fold over flap built from 8mm thick open-cell foam laminated with 4 Ply Taslan® and backed with brushed nylon on the inside. I took care not to step on the bag when my Air was in it, but otherwise felt comfortable slinging Ristretto from shoulder to shelf and table to chair without worrying about damaging the goods inside. There's actually a newer version of Ristretto with a few design changes including a fully zipper-enclosed outer pocket, but my old-style Ristretto has an open area under the main flap that features an organizer-style assortment of pen holders, a key strap with snap hook, room for a small accessory or two, and a small pocket closed by a horizontal zipper. 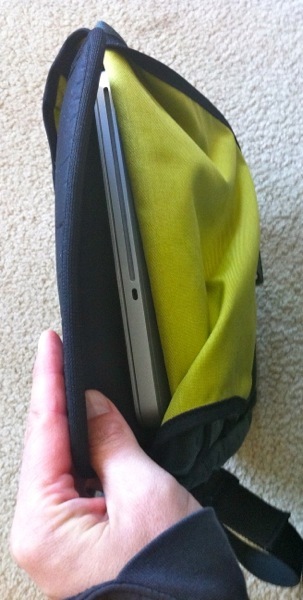 The back of the bag features a slit pocket sized to keep a magazine or newspaper handy without having to open up the main buckle or outer zipper. The bag's pockets were just the right size to encourage me to carry a few essentials (see above), and the main interior space can hold a consumer camcorder, though it won't fit your DSLR. Minimalism for the win, until your Multimedia Editor makes you step up to a big boy camera! I got my Ristretto in a Steel/Wasabi color combination which adds just a touch of flare to what's otherwise a very utilitarian look. The exterior of my bag is made from Cordura, while the newly updated models sport U.S. 1050 denier ballistic nylon that the company says offers "twice the abrasion resistance of 1680 denier fabric." An integrated carry handle spares my shoulders when I remember to use it, but the combination of the bag's light weight and minimal load capacity, and the thick elastic foam of the Ultimate shoulder strap (a $20 option) did really well to spare my neck and back muscles even during full days of carrying my laptop/camcorder around. 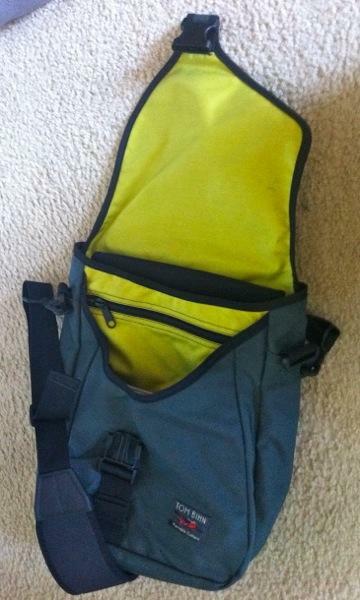 And after a good six weeks of regular use, the bag looks as good as new. $135 is a lot for such a small bag, and $155 with the Ultimate strap is even more, but these things are built to last and Tom Bihn has always offered great customer service to boot. And hey, while they last the older models are a bit cheaper at "just" $110. If you're crazy for your ultrathin, ultralight laptop/tablet and don't mind spending for a tough, minimal way to carry and protect it, Ristretto is well worth a look. Noah Kravitz mourned the day that Star Castle was replaced in the pizza parlour he frequented as a kid. The sadness ended when he saw an older kid make it to the Ninth Key level on the Pac Man that took his place. Years later he’s become a fixture of consumer tech reporting on the InterWebs and TV, and Galaga vies with Zoo Keeper as his all-time favorite arcade games. His loves of music, games, TV, video editing and yapping endlessly at anyone who’ll listen have all been channeled into an Internet addiction that spans screens big and small and devices portable, pocketable, and best left on his desk. Noah has been reporting on gadgets and media for a decade and a half now, including writing, podcasts and videos for PhoneDog, MacDirectory, Maximum PC, PowerBook Central, and a few other publications. He’s also written about the arts, education, and sports for some magazines you’ve likely never heard of, and has invaded your television talking about consumer electronics on CNBC, Fox Business Network, and a host of local TV stations.